As a young man I made a choice to prioritise creative things and fun ahead of a high-flying career. This doesn’t mean I’ve achieved nothing in my working life, however. In fact, this blog post is here to tell you about the proudest moment of my career thus far. It was a decade or so ago, when I was freelancing as a writer and editor. I landed some work with a publisher and started travelling in to their Leamington Spa office for most of the week. The team I worked with were delightful – clever, sparkly, fun and stimulating company. People I’d be very happy to get to know outside of work. So when the first Friday came around, naturally enough, I asked if we were going to the pub after work. Oh, they said, a little confused, um, well, we don’t really do that. Well, that wouldn’t do at all. I urged and I prodded, I coaxed and cajoled, and as the afternoon rolled on a plan took shape. Come five o’clock we’d identified a place to go, pieced together a coalition of the willing, and so off we went for a drink or two. It’s funny, Leamington Spa. Or, to use its full name, Royal Leamington Spa. If you’ve ever been there you might know what I mean. It always seemed to me a pleasant enough place but with an oddly split personality. By day it was one of those well-off and well-kept small towns that dot the English shires: nice deli, independent shops, historic features and a quiet little park. Retired couples oozing wealth, comfortably wrinkled men in beige trousers and those green padded jackets that posh people wear regardless of the season. 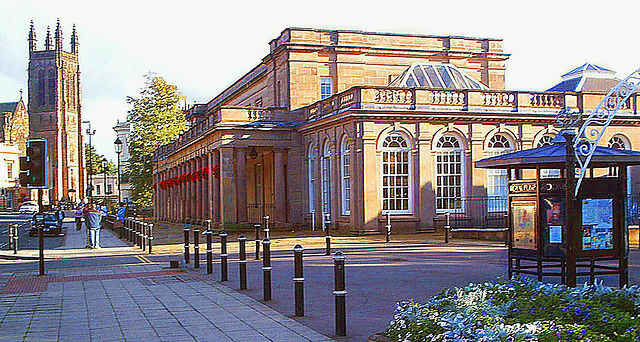 Apparently the BBC sitcom Keeping Up Appearances, a heavy-handed satire of middle-class pretensions, was filmed in Leamington. This sounds about right. By night it went slightly berserk, albeit still in an affluent sort of way. It became less Keeping Up Appearances, more Footballers’ Wives. I can barely even remember the pub we went to. So it can’t have been great. But it’s perfectly possibly to have a wonderful time in a mediocre pub, if you’re with charming people. And that’s exactly what I did. We drank, perhaps a little more vigorously than a sourpuss might sanction. We talked and we laughed a lot. We unwound. We did what millions of people do after work, every Friday of every week of the year. Perhaps we grew a little closer together. Freelancing being what it is, though, I was away before much longer. You’ve no sooner built up a relationship with your colleagues than you have to move on. The company doesn’t need you to stay. If you choose freelancing, you accept the financial ebbs and flows – that’s part of the deal. But you might be unprepared for the abruptness with which working relationships can end. Particularly if they become social relationships too. A year or so later the company asked me to go back. I was happy to get the work, and delighted to see my old comrades again. Before too long, back in Leamington Spa, I asked tentatively about the prospects of seeing out the working week with a visit to the pub. And then followed the proudest moment of my career thus far. Ah, well – actually, Pete, they said, we go to the pub every Friday now. It’s happened ever since you started it off.